The beach tends to lose a few of it’s redeeming qualities in the winter, but so far we’ve been pleasantly surprised by January… with mild temperatures, sunshine, and still no shortage of things to do! One of which has been watching the croakers. Monday night they were out in rare form. 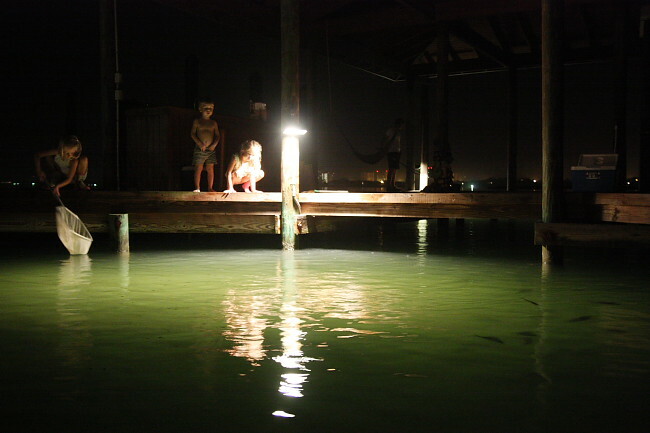 The weather was perfect, so we had a family pow-wow on the dock and entertained ourselves with their presence. 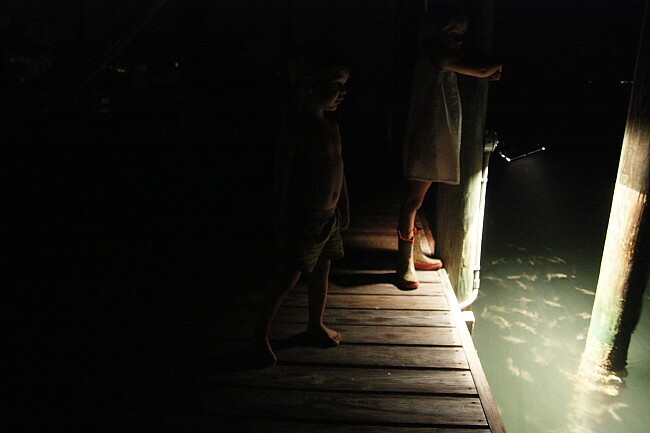 We’ve been watching the croakers for about a week now. They swim against the tide, and have been most prominent when the tide is at its peak, either coming in or going out. Monday night the tide was coming in and they were facing/swimming south. The tides are fascinating. 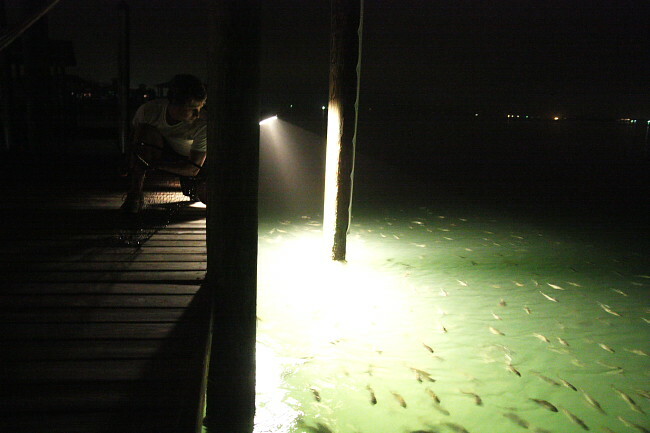 The croakers are fascinating. All of nature truly is fascinating to me. 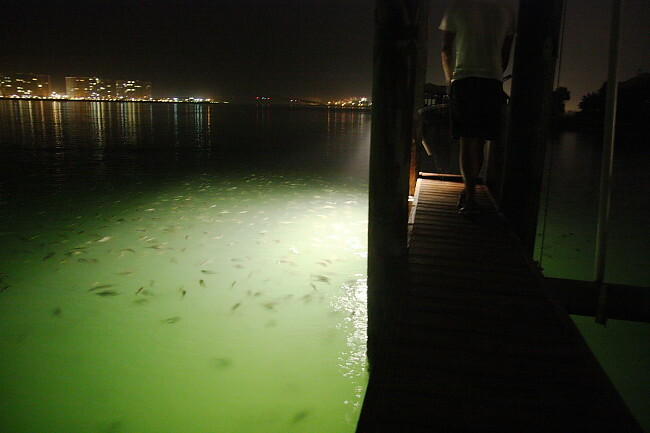 We had a great time soaking in the wonders of the multitude of fish swimming at the dock. And Justin, as you can see in the next couple pictures, is as swift with a net as he is with a gig. We were able to put a few croakers away in our deep freezer and we hope they come in handy when snapper season opens. Paiger was all over the minnows and the minnows were all over her. Of course, baths followed Croaker Fest. Tornados, Spring Break, Easter… and more! Looks like some noisy, slimy, stinky fun! Love it! Check it out! I have never seen such, too cool! NEAT-O!!! I have never seen such either! I love all the photos of your beautiful family and I AM GLAD YOU ARE BACK. I have missed your post! 😀 Glad all is well. Be blessed & can’t wait to see what snapper season brings with these croakers!! btw, I first thought croakers were frogs!! lol! That’s some great fun there! Also some great memory making! And your photography skills are par excellence here…catching that spray of water is quite lovely! I am thinking that those dear croakers who met their demise will be luring some lovely red snapper onto your hooks come spring. Can’t you just taste them already?! Sending blessings your way! Oh, and there’s nothing like smelly, gunky, fishy children, is there?! looks like it was a blast! i commend you for getting your kiddos outside and in to nature… i feel so much of our kids social issues could be solved if we just pull them away from the tv. glad your back to blogging! Glad to see you are back in the blog world! I’ve missed you! Never seen those before! I thought you were talking about frogs at first! Nope, just slimy fish! 🙂 Looks like your kiddos had fun with them! Have your kids seen A Dolphin Tale yet? (Not sure if you have a TV at the beach or not.) My kids absolutely loved it…they are already huge fans of Flipper, so A Dolphin Tale was right up their alley. I just wanted to highly reccommend it as a great family movie…and thought your kids would really enjoy it since y’all are living on the water. awww, to be a kid again. looks like there’s always something entertaining happening at the beach. 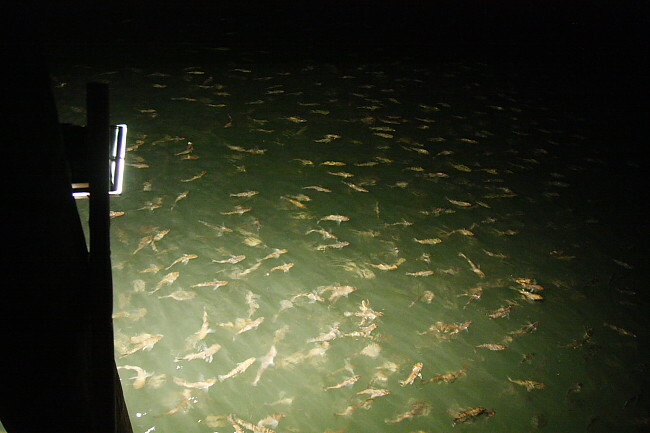 Wow, that is a LOT of croakers! Your children are having such a wonderful childhood. 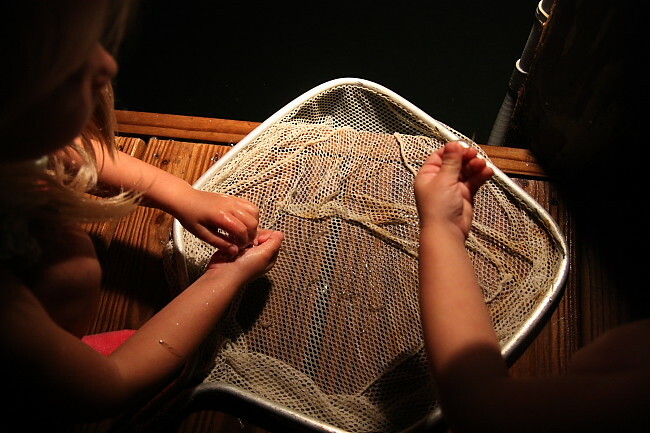 They are enjoying the treasures that great outdoors have to offer, instead of being glued to a TV or game station. Cheers to you and your husband for giving this gift to your kids. That looks like really neat fun! I have never heard of croakers! I just started reading Last Child In the Woods. My sister recommended it to me. I saw in your last post that you are reading it too. Can’t wait to read more of it. I love all of your posts about how you are enjoying your time at the beach. Thanks for posting! Two posts in a row? I love it! We have missed you, but I totally understand the need to stop and enjoy life instead of just blogging about it. Beautiful nighttime pictures! I want to be in weather that warm! Great job taking pictures like that. What kind of lens are you shooting with? I’m new to croakers too. Wow! There were a ton of those little babies! And Justin was the man for sure. 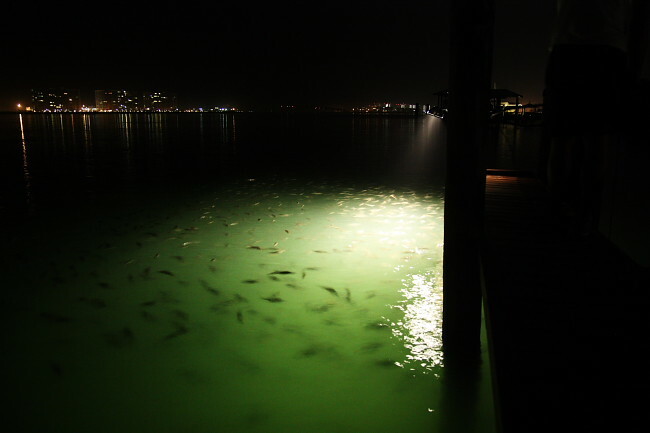 I’m guessing they are used for bait and not eating. Such cool photos. 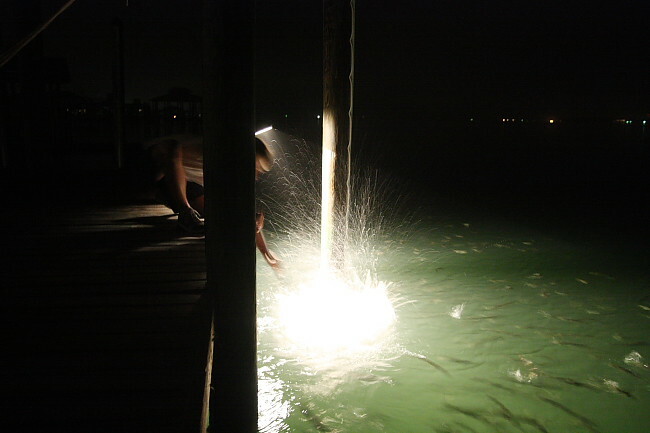 Do you think this was a croaker jubilee? Have you heard of those yet? It was new to us when we moved to Fairhope. Certain types of sea life slip into a hypnotic stage and are easy to catch. It seems the best (liked) jubilees are of the shellfish variety. Look it up. Jubilees are unpredictable! Two posts in one week – what a treat! It’s so fun to see your family enjoying “the little things”. Thanks for sharing with us! omg that looks sooo fun!!!! my daughter would love to do that! Thnaks for sharing your beautiful family with us. oh my that first picture is just plain precious. just wanted to say thanks. i’ve been reading through your photography series & lets just say it’s like a different language from the owners manual to this newbie canon rebel t2i owner. THANK YOU!!! What a fun place to live! Between you and Erica.. I have to read in waves because it makes me miss the panhandle more than I ever thought I would, and I want to pack up and move home yesterday… I can’t wait to be there in March – who knows if I’ll get back on the plane to come back north or not!! 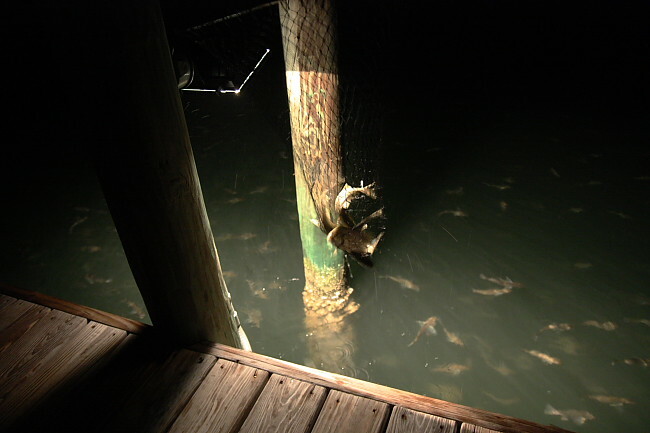 I have never seen so many “full grown” croakers in one spot like that in all my life! And I was a marine biologist on the “Forgotten Coast” in Florida for 8 years. Awesome! I would even love to see this phenomenon. Catching all of those fish looks so fun! 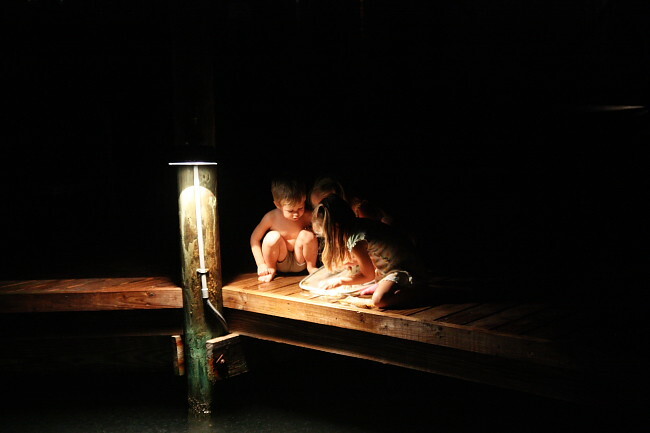 Thos pictures remind me of my childhood at my uncles lake house. We used to catch fish so fast my Dad had a hard time reloading our hooks for us. Loved reading about croaker fest! You guys are living my dream…keep having fun. I know being away from familiar, friends, church, etc. is hard. But you and your kids are having experiences you’ll remember for a lifetime. Keep posting when you are able…I miss the beach and love getting to see your pictures. Geez, I’ve never even heard of those fish. Are they mating?? Now snapper I’ve heard of, super yummy roasted on the grill stuffed w/ onions/tomato/garlic sauteed in olive oil before stuffing…I envy that water lifestyle! It’s January and your children are at the beach in t-shirts and shorts – that’s a TON of redeeming factors right there! You have obviously not lived in the Northeast in the winter with children, where coats, scarfs, hats and mittens are required from October to April. OK, so I don’t have a great story, but I want those tkiects! My fiancee and I have been together for about 9 years, and finally got sick of the “So when are you getting married” barrage from family & friends. So we talked about it, decided it’s about freaking time, and went ring shopping. Suddenly, girls I barely know are squealing and giving me uncomfortably long hugs, and I’m a little tired of the whole wedding idea already. Then I stumbled on the Indie I Do show, and fell in LOVE with the idea! I’m going whether I get the free tkiects or not (although free tkiects would be nice), in the hopes that I find some original ideas that might make eloping seem less appealing. We miss you and your sage advice, adventures in crafting, the classic beauty of your family, and very simply your words. I hope you and your family are continuing to enjoy each other. Hope to see you back soon. Missing your posts (and Erika’s), too. Life must be oh so busy. Beautiful family. Share your faith and roots–raised our kids in NW Chicago suburbs. A lovely experience. so happy life! I just envy it!